Synthetic peptide (the amino acid sequence is considered to be commercially sensitive) within Human PD-L1 aa 250 to the C-terminus. The exact sequence is proprietary. WB: Chinese hamster ovary cell lysate overexpressing PD-L1; NCI-H1975 whole cell lysate. IHC-P: Human tonsil, placenta and stomach cancer tissues. ICC/IF: CHO-PDL1 and NCI-H1975 cells. IP: NCI-H1975 whole cell lysate. Flow Cyt: CHO-PDL1. Our Abpromise guarantee covers the use of ab213524 in the following tested applications. Antigen retrieval: Universal HIER antigen retrieval reagent (ab208572). Immunohistochemistry (Formalin/PFA-fixed paraffin-embedded sections) analysis of human tonsil tissue labelling PD-L1 with ab213524 at a dilution of 1:250. Heat mediated antigen retrieval was performed using AR9 antigen retrieval solution, and microwave treatment for 15 min at 20% power. 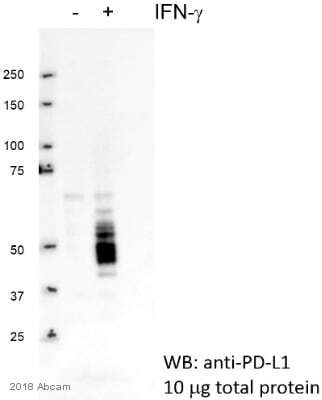 Anti-Rabbit/Mouse HRP polymer (PerkinElmer Opal Polymer HRP Ms Plus Rb) was used as secondary antibody. Opal tyramide amplification was performed using Opal 520 fluorophore. Counterstained with DAPI stain. Image scanned with Vectra 3.0 and analyzed via Phenochart software. Immunohistochemical analysis of paraffin-embedded human tonsil tissue labeling PD-L1 with ab213524 at 1/250 dilution, followed by Rabbit specific IHC polymer detection kit HRP/DAB (ab209101). Membrane staining on the human tonsil crypt epithelium is observed. Immunofluorescent analysis of 4% paraformaldehyde-fixed, 0.1% Triton X-100 permeabilized CHO (Chinese hamster ovary cell line) cells labeling PD-L1 with ab213524 at 1/100 dilution, followed by Goat Anti-Rabbit IgG (Alexa Fluor® 488) (ab150077) secondary antibody at 1/1000 dilution (green). Confocal image showing membrane and cytoplasmic staining on CHO-PDL1 cells. -ve control 1: ab213524 at 1/100 dilution, followed by Goat Anti-Mouse IgG H&L (Alexa Fluor® 594) (ab150120) secondary antibody at 1/1000 dilution. Flow Cytometry analysis of CHO-PD-L1 (red) and CHO-S (blue) cells labelling PD-L1 with ab213524 at 1/500. Cells were fixed with 4% paraformaldehyde, permeabilized with 0.1% tween-20-PBS and blocked with 10% goat serum. An Alexa Fluor® 488-conjugated goat anti-rabbit IgG (1/2000) was used as the secondary antibody. Immunofluorescent analysis of 4% paraformaldehyde-fixed, 0.1% Triton X-100 permeabilized NCI-H1975 (Human lung non small cell carcinoma cell line) cells labeling PD-L1 with ab213524 at 1/100 dilution, followed by Goat Anti-Rabbit IgG (Alexa Fluor® 488) (ab150077) secondary antibody at 1/1000 dilution (green). Confocal image showing weakly membrane and cytoplasmic staining on NCI-H1975 cells. -ve control 1: ab213524 at 1/100 dilution followed by Goat Anti-Mouse IgG H&L (Alexa Fluor® 594) (ab150120) secondary antibody at 1/1000 dilution. Immunohistochemical analysis of paraffin-embedded human placenta tissue labeling PD-L1 with ab213524 at 1/250 dilution, followed by Rabbit specific IHC polymer detection kit HRP/DAB (ab209101). Membrane staining on the human placenta is observed. Immunohistochemical analysis of paraffin-embedded human stomach cancer tissue labeling PD-L1 with ab213524 at 1/250 dilution, followed by Rabbit specific IHC polymer detection kit HRP/DAB (ab209101). Membrane staining on the human stomach cancer is observed. The lower band is predicted to be isoform 2. The expression profile/ molecular weight observed is consistent with what has been described in the literature (PMID: 26546452). PD-L1 was immunoprecipitated from 0.35 mg of NCI-H1975 (Human non-small cell lung cancer cell line) whole cell lysate with ab213524 at 1/30 dilution. Western blot was performed from the immunoprecipitate using ab213524 at 1/1000 dilution. Lane 1: NCI-H1975 whole cell lysate 10µg (Input). Lane 2: ab213524 IP in NCI-H1975 whole cell lysate. Lane 3: Rabbit monoclonal IgG (ab172730) instead of ab213524 in NCI-H1975 whole cell lysate.